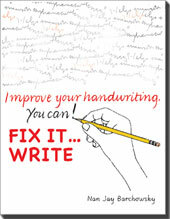 Fix It…Write helps older students (ages 10 and up) and adults to improve or change their handwriting for greater legibility and speed. The format is hole-punched, loose-leaf sheets with instructions, lessons and lined sheets for practice. Users are encouraged to date their practice pages and to keep them in a ring binder. Review of the work after about two weeks will amaze, and encourage the user to continue. Fix It…Write is in two sections. In the first section instruction is based on italic letter formations, a method that conforms well to natural movements of the hand. It’s best for those who primarily use print-script. The other section is for those who prefer conventional cursive, and who have the same need for improved handwriting. Users may wish to practice with words and sentences that relate to individual interests. Practice becomes more entertaining! If working with the BFH method, use the Barchowsky font to create custom pages. Either a hard copy or a downloadable version is available.